After my successful attempt at Aglio-e-Olio, I was tempted to explore more sauceless pasta recipes, so here is one of them. Boil and drain the pasta as per the instructions on its packet. Heat olive oil in a non-stick pan on low-medium heat. Add the garlic and the sausages. Saute for 5-7 mins. Add the mushrooms and cover the pan with a lid for 3-4 mins. Once the mushrooms start shrivelling up, remove the lid. Add the broccoli, vegetable stock, salt and pepper to taste and cook for another few minutes till broccoli becomes slightly soft (Don’t overcook the broccoli). Finally add the pasta and some parmesan and mix well. Turn off the heat. Sprinkle some chilli flakes and garnish with freshly chopped parsley. You can also sprinkle some parmesan while serving. 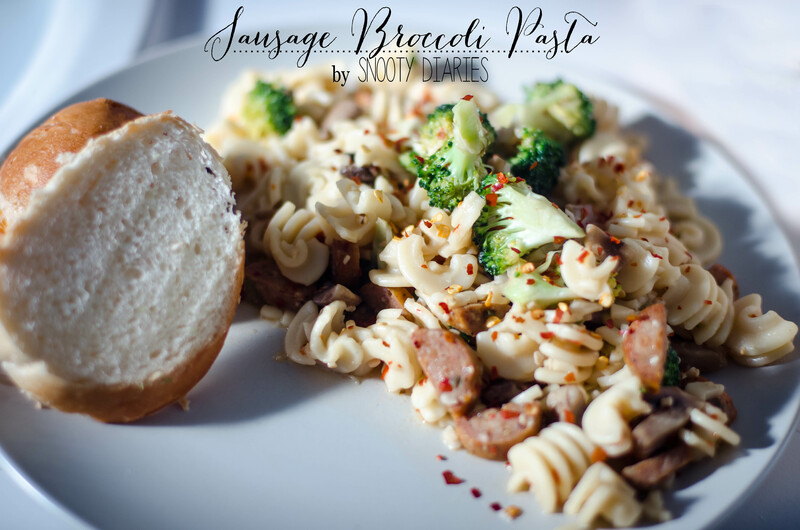 This entry was posted in FOOD, pasta, Recipes and tagged aglio e olio, Broccoli, Cook, Garlic, healthy, home, Olive oil, Pasta, Sausage. Bookmark the permalink. I will try it !! sounds n looks super yummy..good pic..Ms. photographer!! !